I made this design and I would like to hear from your remarks too improve the design. I see you design an i'm thinking why don't you make it a middy? Maybe four wheel drive. Or if front engined why not use a car engine like an impreza or something? It looks a bit cramped in there!!!! Looks a bit boxy ala 90s Mazeratti for me!! I like it, but with all the bodywork, glasses, roof, etc. will it not be too heavy for a bike engine? What sort of weight are you thinking to end up with? I also think a car engine would suit it better. Or a small supercharged engine? are the headlights lego bricks? i think without a roof would be good - but still with the cage. It si just as good as many production cars. Roof seems a little low for the driver/passenger , other wise it looks ok in a boxy kind of way. I thought Lancia delta as a lookalike, but the alfa sz is even closer. - Looks like there could be rear bias on the weight, (2x80 kg?) rear of the middle of wheel base, only engine (70 kg?) to offset it?). - Short wheelbase would probably make it twitchy. - B-pillar of frame could obscure side view. 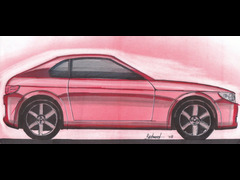 - Otherwise design looks good, but I would like the rear to end in a "straight cut" or a spoiler, not rounded as shown. - I would also like a bit more headroom, as now there would be very little, would be dangerous in a roll over. Also traffic lights can be hard to see in the current configuration due to the same reason. - Entry/exit could be difficult, at least with seats of the kind shown. I was inspired by the Moretti Gran Sport 750 and wondered how a modern version would look like. Yes, I did look at the SZ for the proportions. Im guessing that the weight would be around 550kg. Afterall is just like a SWB 2cv with an engine conversion, Fisher Fury with hardtop or a Z-cars Mini. 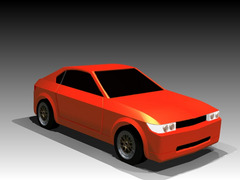 The model is in Autodesk Inventor 10, very similair to Solid works. The weight distrubution should be similar to a BEC locost. 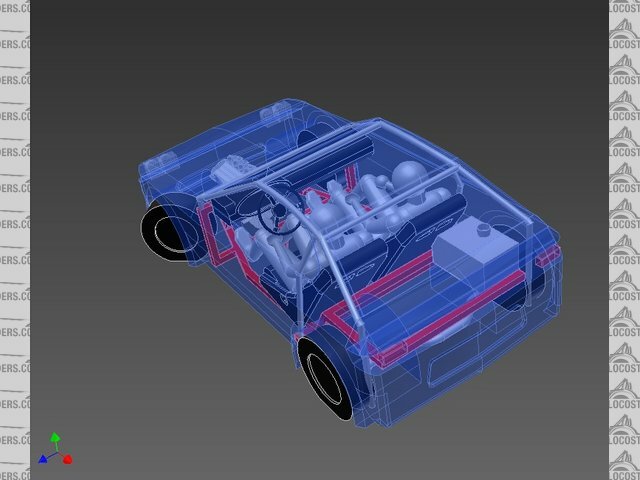 I will post an update after this weekend since I modeled a petrol tank and added 15mm more headroom. But I will move the B-pillar 50mm back. 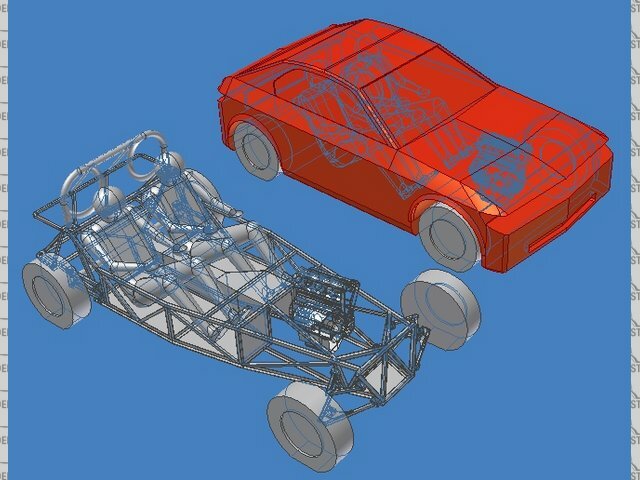 I can gain futher space by redesigning the rollcage. In these pics the rollcage are upto 60mm thick. Too heavy for a bike engine by virtue of the full body. Wow - you seem to be making life hard for yourself. Why is the car so small? This is going to cause a number of issues – you show a full coupe body: have you identified a windscreen small enough to use, side windows and door architecture? If you're going to use existing items (the most logical approach) then these need to be selected early in the design process to integrate them properly. Same point about the lights. If it's bike engined, why front mounted? Mid-mounting would make drivetrain smaller and lighter. 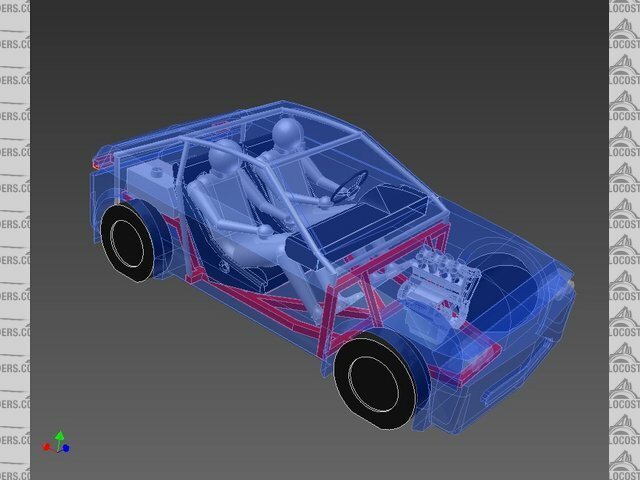 Your current proportions are in fact more extreme than the SZ, and the Smart Roadster proves a midengined layout can give the kind of proportions you're after. Your two stated influences are a Moretti, cute and pretty, and an SZ (a.k.a. Il Mostro), which, er,.... isn't. Not much common ground there, you might want to tighten the focus further. The software you're using may be suitable for engineering design, but apparently not for styling: there are too many flat surfaces - I'm assuming curved surfaces are harder to model. If the tool is consciously (or worse, unconsciously) influencing the solution due to it's own limitations, then maybe a different tool should be used... Look at any car, even from the 70's and try to find a truly flat panel: most curve in at least one plane. The glazing is also flat – the last car I can think of with truly flat glass is the original Fiat Panda, and famously it was more expensive to make than curved glass but Giugiaro wanted a utiliarian look. Look - and I mean really LOOK - at an SZ: notice how curved the shoulder and beltine are, how much form there is in the front fender, that the A pillar and glasshouse are in fact very sleek. Track down some elevational drawings of the SZ (or anything else you like) and study them. Do some more sketches, make a model: once you've finalised the mechanical package, model it in some blocks of wood and then sculpt a body over it in plasticine (it has most of the benefits of modelling clay but is far less hassle); or whatever you prefer - card, paper, styrofoam. 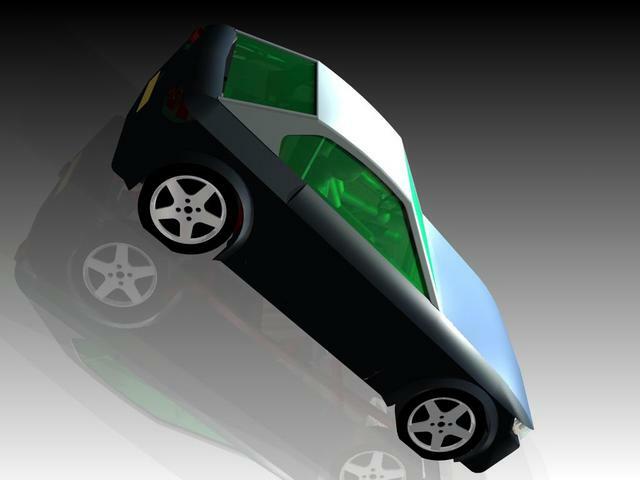 I like small cars, also with a BEC you need low weight thus small dimensions. All the windows are flat since these are easier to make and buy, just go to your local glass company. So I maked windows to fit the design not the other way round. The lights are universal Hella items behind a perspex cover. Front mounted gives a nice weight distribution plus luggage space. Well the Moretti gave me the inspiration for the packaging and the Alfa for the styling. And that's just the way I like it! Yes, you are right that the software is a bit limitating but Im not after designing a E-Type so it will be OK. The Countach is pretty flat too as all Locosts. I'm considering to taper the rear part of the greenhouse so the rear end will look wider, but I need first to finish the mechanics. Having gone through this thread again I'm a little confused - are you doing this as an academic exercise or are you really intending to make this. If you want a good design, you need to be your own harshest critic. 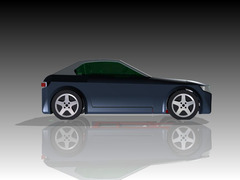 Some things that seem contradictory - you mention low weight, but you've made it a coupe, you want to make it small but you also mention luggage space. A front mounted BEC which not only makes the drivetrain heavier, it makes the weight distribution worse in this case. Your design isn't small - it's tiny! And just because you can cram it all in that doesn't make it a good idea. 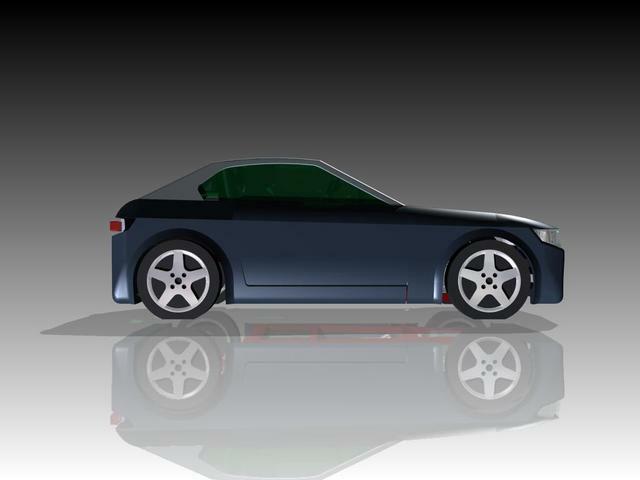 The wheelbase is just over 2m - about 300mm shorter than a Smart Roadster, the only similar modern vehicle I can think of: this is car is going to be twitchy, if not dangerous, at speed. I think you'll have some cabin space, mechanical packaging & heat management issues as well. Yes, the Moretti is as small but I don't think it would be capable of the kind of speeds a modern BEC can achieve and if you scale up the performance you have to scale up everything else to match. As for the styling - study a Countach and apart from the glass show me a panel that's TRULY flat, and as well as aesthetics there are good reasons for this: a flat panel is less rigid, therefore more likely to sag under it's own weight and more likely to resonate / vibrate and more susceptible to damage. Look at the Locost - the only truly flat panels are the floor and the lower chassis sides, you can see sections through the nose cone here: http://www.georgecushing.net/nosecone.html - the bonnet isn't truly flat. Even if the surfaces were flat, the Countach is a low slung, dramatic wedge and the Locost (like all sevenalikes) is a central cigar fuselage with outrigger wheels at the front and large rounded wheelarches at the rear - sculpturally both are interesting shapes; your design is a basic box shape. If you stick with flat, or even nearly flat, surfaces it will be ugly - trust me on this. And right now you don't have enough room to taper the rear of the glasshouse enough without making it bigger. If you don't like GRP, then make a model from card - anything you can do with a sheet of card you can do with a sheet of metal; and that includes curves. As you mention luggage I assume you're thinking of using this on the road, in which case you can't "just go to your local glass company" unless they sell toughened glass, which can only be used for side and rear windows anyway. The windscreen must be laminated, must have a kite mark and cannot be cut down to size. Flat side windows won't work with any modern winding mechanism - you'll need one from an old Panda. As well as the engineering, you need to research the legal side of things if only to save yourself a lot of wasted time; I see you're in the Netherlands but my understanding of the IVA is that it's a European standard. 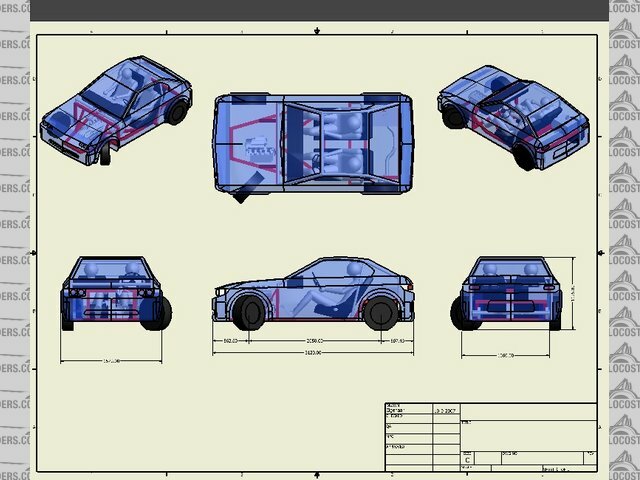 I hope you prove me wrong, but I still think you're taking on the whole world in what is obviously your first project, this does not improve your chances of success: designing & building a car is a big enough challenge without making life any more difficult than it has to be. Well, for now it is more like an academic exercise then for real. Even when I would consider building it, producing and selling would be another chapter. Im imaging that I would use it to drive it to track days and hill climbs abroad. Currently Im busy with other stuff in life. 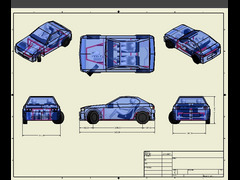 Although on the planning is the modelling of the front suspension. Styling/ design is always personal, however it is too easy to make a curvy good looking car like an E-type. What are your thoughts about the Minis with bike engine conversions? It is in the same range of dimensions. Also equipped with flat side glass. Originally posted by ettore bugatti ...it is too easy to make a curvy good looking car like an E-type. ROFL - yeah, that's exactly what I thought too: it's not just easy, but TOO easy to design a car that nearly 50 years on is still consistently rated as one of the most beautiful cars ever and one of the few ever exhibited in MoMA, that's why everybody's at it. Styling is highly subjective but that does not mean there aren't quantifiable, objective elements as well - such as stance, proportion, balance etc. The Panda is still the most recent design I can think of with flat glass. When the mini was designed a lot of cars still had flat glass but it does have a curved windscreen, and every body panel is also curved. The Mini is a classic but a product of it's time (half a century ago) and were I designing something new today to pass current certification it still wouldn't look like the Mini - especially if intending to go on foreign trips. If it does progress beyond a theoretical exercise I'll be interested to see how it turns out, until then, good luck.